As with most national parks, pets have limited access within Yosemite National park. Pets are not allowed on unpaved or poorly paved trails, in wilderness areas including hiking trails, or on shuttle buses. However, there are still several nice areas to walk with your pooch and still be able to see many of the sights and points of interest. In general dogs are not allowed on unpaved trails, but this park does make the following exceptions. 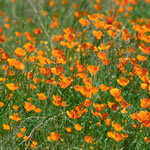 Dogs are allowed on the Meadow Loop and Four Mile fire roads in Wawona. They are also allowed on the Carlon Road and on the Old Big Oak Flat Road between Hodgdon Meadow and Hazel Green Creek. Dogs must be on a 6 foot or less leash and attended at all times. People must also clean up after their pets. 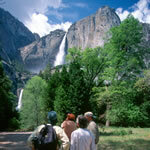 For a detailed map of Yosemite, visit their web site at http://www.nps.gov/yose/pphtml/maps.html. The green dots show the paved trails. 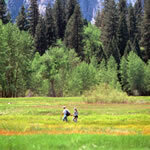 Dogs are allowed in developed areas and on fully paved trails, which include approximately 2 miles of paved trails in Yosemite Valley. 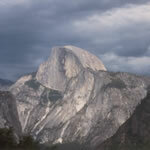 From these trails you can view El Capitan, Half Dome and Yosemite Falls. You can also take the .5 mile paved trail right up to the base of Bridalveil Fall which is a 620 foot year round waterfall.